The majority of parenting tips you come across tend to be catered to moms. It’s not surprising, but it can be insulting for all the dedicated dads out there. Times have changed dramatically, with more men than ever before taking on a more prominent parenting role. If you’re a hard-working dad, or a stay at home single father, here you’ll discover the top 10 parenting tips that will make your life significantly easier. Of course, some of these you’ll already have heard or know, but it could never hurt to go over thema gain. 1. Feeding – How Much Milk Does Baby Need? Bottle feeding your little one is an awesome experience. Whether you’re taking over some of the night feeds, taking over while mom gets a little break, or you’re a single dad taking care of all of the feeds, knowing how much your little one needs can be confusing. The main thing to remember is your baby has a very tiny tummy. So, they aren’t always going to be able to finish the bottle. The amount of milk they need is small and increases as they grow. In fact, the amount they can drink increases pretty quickly in just the first couple of weeks. According to experts, at just one day old, infants can hold up to 5ml of milk, while on day 10, they can hold 60ml. There’s a lot of advice online and if you’re concerned it’s best to ask your pediatrician. They will be able to give you plenty of tips on how much milk your little one should be drinking. As a general rule, if your baby is dribbling a lot of milk after each feed, you’re giving them too much. After feeding your little one should be content. If you find they are a little fussy, it’s likely they just need burping or may want a little more. It’s not rocket science, but all common sense can go out of the window when your little one arrives. Being a dad is tough and at times you’ll feel yourself becoming overwhelmed. It’s really important to make sure you take little breaks. Whenever you feel yourself starting to become over-stressed, take a time out. A few long, slow deep breaths an work wonders; especially when baby just won’t stop crying. As well as short time outs during stressful days, you should also try to have one night off a week. Just like its important for moms to take a night off and recharge, it’s important for dads too. Have a night out with your friends, lock yourself away and indulge in your favorite movies or just go for a drive. If you allow yourself a night off from all of the stress in your life, you’ll come back feeling a lot more refreshed and ready to take on fatherhood. Many dads find it difficult knowing what to do with their baby, especially when they’re stressed out. Playing with your little one is a great way to relieve that stress. Most importantly, it really helps you to bond with baby. In the early infant stage, there isn’t a lot of playful activities you can really do. Babies are known for spending all of their time sleeping, eating and pooping in the early stages. However, they do love to be talked to. They may not understand what you’re saying, but the sound of your voice is often enough to soothe them. Many couples have no idea just how much a baby will change their relationship. The added stress can cause significant tension, leading to a lot more arguments. Of course, this extra tension isn’t just bad for you – it’s bad for your little one too. Although it’s tough when you’re dealing with sleep deprivation and the added pressure to provide for your family, try to be patient and understanding of your partner. They are going through the same thing and after giving birth, a woman’s hormones are all over the place. Of course, you should never under any circumstances say that out loud to her! However, keeping that in mind when it seems like she’s overreacting and being unreasonable, can be a big help. It’s important to try to keep the romance alive. So, once a week try and organize a sitter so you can have a date night. You don’t necessarily have to go anywhere, but just spending time together with just the two of you away from the baby can help strengthen your relationship and make you better parents as a result. Another thing that’s going to help you be a better dad is to make sure mom gets some time to herself too. Just as it’s important for you to take some time out, she also needs a little time to herself. Offer to take care of the baby one day a week so she gets some much needed time to do something non-mother related. The key to being a good parent is ensuring your little one grows up in a healthy, nurturing environment. Giving mom some time alone to take a break is part of creating a happy, healthy home life. Affection doesn’t come easy to everyone. However, it’s really important for baby as affection is how they understand what love is. They don’t understand words, so simply telling them that you love them isn’t going to help feel it. What does help is plenty of hugs, kisses and skin-on-skin contact. Affection becomes increasingly important as your little one grows. It’s one thing that for some reason, many dads feel uncomfortable with. But you’re going to need to get over that if you want to raise a confident, healthy child. Swaddling is one of the top tips you can follow. It’s basically like a little “baby burrito”, where you wrap your little one up so they feel warm, cozy and secure. It actually reminds them of being in the womb. So, if you’ve tried everything and baby just won’t stop crying, swaddling could be the answer! There are a lot of in-depth guides and videos online that can show you how to do this. Alternatively, ask your pediatrician to show you how it’s done if you learn better when you’re shown something in person. Just try to be attentive when swaddling after your baby reaches the age of 2 months and has the capability to roll over. If a baby is swaddled and ends up sleeping on its stomach, this can increase the risk of Sudden Infant Death Syndrome. It’s surprising how many things you need to take with you when you’re heading out with baby. A diaper bag becomes an essential that you can’t leave home without. However, first you need to know exactly what should go in it. You’re going to need a few diapers, two changes of clothes just to be safe, baby wipes, a burp rag, wet bags, bottles and formula, water to mix up the formula and an extra pacifier if your baby uses them. These are just the basics! Many parents have learnt the hard way to carry around more than one diaper and change of clothing when they head out. Changing diapers is probably the least fun part of parenting. However, it’s one of the most basic skills you’re going to need to learn. If you have a little boy, one thing that’s going to really help to know is that the minute their diaper comes off, it can cause an almost fountain effect. Out of nowhere, pee will spout up and if you’re unprepared, hit you right in the face! This is thought to happen because of the cold air on baby’s tummy. Whatever the reason, it isn’t pleasant. You can avoid it by using the front of the diaper as a little shield and having the clean diaper ready to put straight on. This is a skill you’ll learn the more that you do it. It’s easy to lose confidence in your ability to be a good dad. Being a parent is terrifying and extremely hard work. Many dads feel like failures because they can’t do something as well as mom. However, what you need to remember is you don’t have to do everything the same way as your partner, parents or friends. Have faith in your own techniques and ideas. Dads have their own skills and techniques and if you really don’t know how to do something, look it up. You’ll find so many tips, advice and even videos which show you how to do things. Come back here regularly and subscribe to our YouTube channel, because we publish helpful articles for you several times a week. It’s worth checking back, I promise! Overall, being a good dad is all about showing up and putting in the effort. No parent has all of the answers and they all make mistakes. 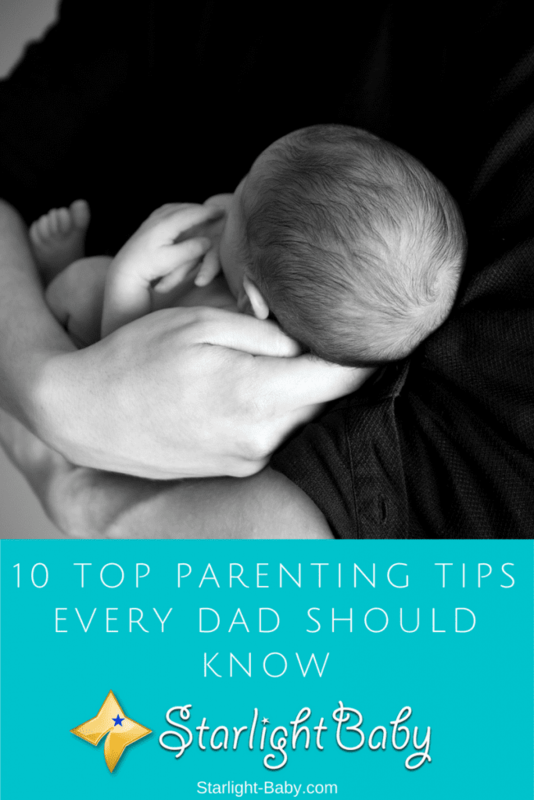 The tips above will make being a dad that little bit easier, but most importantly enjoy it! Babies grow up so quickly so make the most of each moment you share with your little one. I like the way you introduced the topic pointing out how so much parenting tips are always accorded to the mums only. There are dedicated dads out there just like you stated who need articles like this, in someway to motivate or rather appreciate the role they play in supporting the mum during parenting. Though most men think nursing a child is mostly the responsibility of women which I disagree with, times have changed. Supporting the mothers I’m any way possible makes parenting even easier and also helps to keep in touch with both mother and child with regards to communication and understanding. Great points by the way. This is so true @Rumu, people always have the misconception that taking care of babies is solely for the mothers but is really not true. Fathers are equally part of the the taking care responsibility of the baby, so therefore in any way he could assist in the well being of the child, it’s definitely important. Most men find diapers change more intimidating but this is not a big, by just observing how the mother does it couple of times, and you would get used to it. I love everything you said, Rumu. You nailed it! Indeed, times have changed and more dads now play active roles in child care which is the right thing to do. Women would very much love it if some of the burdens are taken off their shoulders by dads. Thanks for this very nice piece of article. Dads also play a role in taking care of the baby, it is not just the mom. Salute to all the fathers who take turn in feeding the baby in the middle of the night while his wife is regaining strength. I really love the part when dads let their wives take time for themselves. This is very true and so highly important. Mothers sometimes feel stressed out and emotionally drained when they are left alone in the house taking care of the baby. It would be a great relief when the father offers a hand and let her do some things for herself. This is also a great way of bonding time between the father and the baby. Awesome tips for dad looking to be great with their little ones. Being a dad is not easy at, especially when you are looking to be of good assistance to your wife and the baby, it’s really demanding and time consuming. Of all the tips discussed here, I find the 10th tip very important because without having confidence, you would easily give up before you even started, or should you make any mistake, you will conclude immediately that you are not good enough. So confidence is the first key for me. When my wife was pregnant, I said to her, ask me anything except to change diapers and clean the baby. She agreed. However, when my baby was born I ended up changing the baby and cleaning the baby. They say necessity is the mother of invention. I ended up learning to change diapers and wiping the baby. One of the difficult things for the dads is feeding baby. I have not been able to feed the baby properly since 11 months. I’m sure you will eventually learn to properly feed your baby in time. We wish you the best!